Ampex Model AG-440B and AG-445B Magnetic Tape Recorders and Reproducers have a very-quiet tape transport usable with 1/4-inch or 1/2-inch tape, and have solid-state plug-in electronic modules. Up to two channels can be used with 1/4-inch tape, and up to four with 1/2-inch tape. The AG-440B is a record/reproduce machine, and the AG-445B is a reproduce (only) machine. The tape transport, designed for very quiet mechanical action, consists mostly of sub-assemblies which may be removed without unsoldering connections. Heads plug into receptacles inside the head housing for easy removal and installation. Most relays and electronic circuits are also the plug-in type. The AG-440B tape recorder/reproducer is available either mounted in an Ampex console, mounted in portable cases, or unmounted for vertical or horizontal installation in a rack or custom console. The basic system consists of a tape transport, a head assembly, and one record/reproduce electronic unit for each channel. Each record/reproduce unit contains a built-in Sel-Sync circuit for recording added channels in perfect synchronization with previously recorded channels. Plug-in accessories, such as a microphone preamplifier, a balanced line-input transformer, and a remote control unit are available as optional equipment. The AG-445B reproducer is available either in a console or unmounted for installation in a rack or custom console. Up to four reproduce electronic modules will fit in the supplied mounting tray. Foundational text courtesy of AMPEX 440B Operation and Service literature. 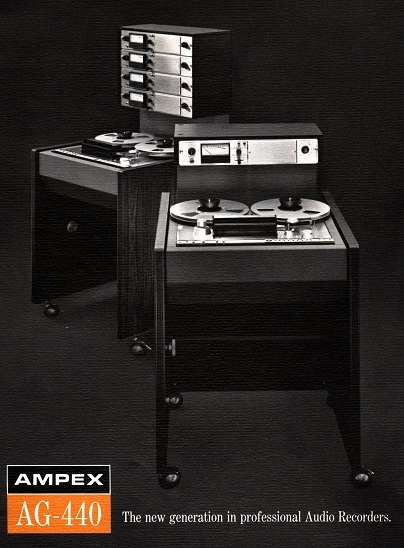 Do you have content, to add, about the Ampex AG-440B Tape Machine or associated topics? Please feel free to Share it, here!